The Kollam tragedy has assumed apocalyptic proportions and the death toll is on the rise. Reports say 451 people died in fireworks-related accidents in the last three years in Kerala. But the Kollam tragedy is of a different kind. It was the colossal price people had to pay for the scant regard that all concerned had for law. The incident poses significant questions related to the lawlessness at the micro level, which is the direct result of administrative failure at the macro level. A police force that is neither assertive nor independent succumbs easily to pressure exerted by temple committees, which are often hand in glove with local politicians. This nexus flouted the district administration’s prohibitory order. A few are now booked under Section 304 of the Indian Penal Code (culpable homicide not amounting to murder) and provisions of the Explosives Rules. 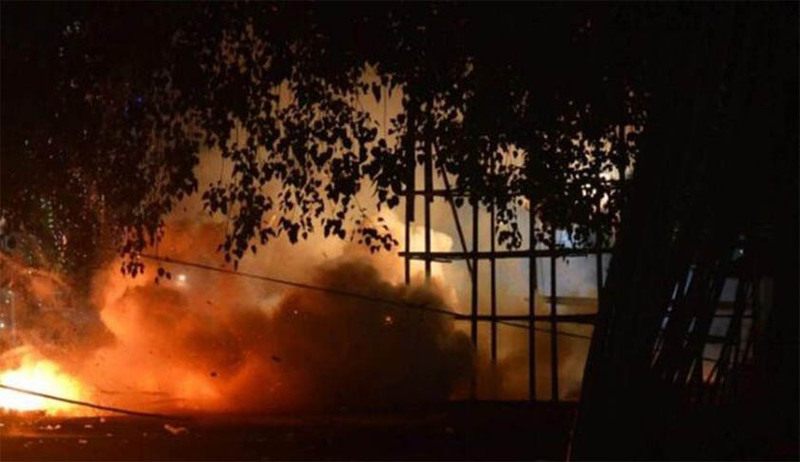 After the tragedy, though a special bench of the Kerala High Court criticised all concerned in its April 12 order, it did not venture to ban the deadly firework displays as such. As a result, the Devaswam officials in charge of Thrissur Pooram, another mammoth temple festival, have openly stated that they are unable to abandon firework shows just because “there have been occasional accidents”. This when firework shows are banned even in Lucknow following the Kollam tragedy. The Kollam district administration is also complicit in the matter, for it did not intervene to prevent the unauthorised activities. The District Disaster Management Authority is constituted under the Disaster Management Act, 2005, and is chaired by the District Collector. The Institute of Land and Disaster Management, functioning under the State government’s Department of Revenue, published a “Standard Operating Procedure (SOP) for Festival Disasters” in 2015. It contains “detailed guidelines to cover the entire safety aspects of the festivals”. The SOP is also categorical when it says that, “if the event has a firework or pyrotechnic display, a request for approval from the concerned nodal authorities shall be made in writing through the proper channel at least one month in advance” and that “the firework approval form should be in the licence from LE 6 in line with the Explosive Rules, 2008”. Other significant stipulations include “storage of firecracker in safer places” and keeping of “proper space for emergency operations”. Had there been fortitude and determination on the part of the district administration to invoke the SOP, the disaster could have been avoided. The executive failure is a hideous reality that warrants more stringent judicial intervention. Some of the laws on explosives are inadequate and obsolete. The Explosives Rules 2008, promulgated as per the Explosives Act, 1884, though hyper technical in their content, are often ineffective to meet the social exigencies and situational realities. According to Rule 9, the possession and use of certain types of fireworks, which again are dangerous, do not require licences at all. For example, according to Rule 9 (9), “possession and sale from a shop of amorces and sparklers in quantity not exceeding one hundred kilogram” do not require any licence. Rule 4 classifies the explosives and Rule 5 talks about the safety distances which are explicitly indicated in the schedules. Possession of explosives is permitted only on the premises specified in the licence. The licence prescribes an optimum quantity of 15 kg of gunpowder. The licence talks about maintaining “a distance of at least 45 metres from the place of the storage shed, manufacturing shed and spectators or devotees”. Altogether 28 conditions are to be incorporated in the licence, going by the schedule. The ostensible irony is that even these inadequate statutory safeguards are ignored in a State that boasts of good governance. Reports show that in Kerala, even when permission is granted for storing 2,000 kg of explosive substances, poorams use 32,000 kg or more. When the optimum noise level prescribed during the fireworks show is 125 dB, which in itself is unscientific and risky, the level is often escalated up to 165 dB. Moreover, Section 3 of the Explosive Substances Act, 1908, makes any unlawful act causing explosion an offence punishable with life imprisonment even when no injury is caused. Other provisions in the statute also are equally stringent. The mere fact that the Explosives Act (or the Rules) permits the use of gunpowder and other explosives, including fireworks, shouldn’t stop the government from totally banning the use of explosives in public places. Even without drastic legislative intervention, the government can promulgate an executive order imposing a total ban in view of the gargantuan tragedy. But since a legislative or executive move is very unlikely due to multiple reasons, a judicial intervention to ban firework shows is imperative. A reckless firework show is terrorism in disguise. In Re Noise Pollution (2005) 5 Supreme Court Cases 733, a bench consisting of justices R C Lahoti and Ashok Bhan imposed certain regulatory measures on the use of fireworks. The case was more concerned with noise pollution than human safety. The court could not even think of a mammoth tragedy as has now occurred. The permissible sound levels and the timings (not after 10 pm and before 6 am) for using firecrackers are prescribed in the judgment. Also, there is a direction to the manufacturers to declare the contents of firecrackers. The apex court judgment, however, does not take any extreme position. Now, it is time to take an extreme position for the sake of human lives, because that alone can lead to even moderate solutions. The above article was published in The New Indian Express on 14.4.2016. The High Court of Kerala has , by its order dated 14th April 2016, permitted fire works display in Thrissur Pooram that was scheduled for 17th of April 2014. However, the need for a new Legislative and judicial look into the issues may not be disputed.